sometimes distorting or exaggerating the subject for impact and interest." 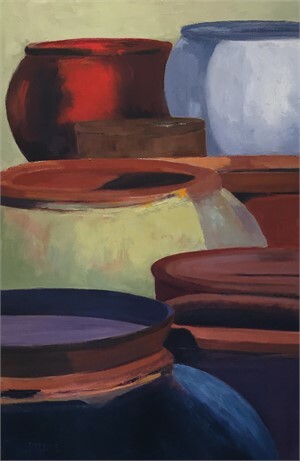 Carol Pierce has had both solo and joint exhibits. For solo shows, her personal record was creating 64 works for one show. "I'm a prolific painter and am serious about my work." said Pierce. "My most popular work is my series of ollas." Although Pierce maintains studios in both Denver and Mexico, she’s a genuine Denver local, having her primary residence there for 35 years. She produces original oil paintings year round, which keeps up with buyer demand and gives her the ability to fill gallery walls. Pierce earned a Bachelor of Arts Degree in Art, and has studied at the Cleveland Institute of Art, Curtis Art & Humanities Center, and the Art Students League of Denver. She continuously advances her skill by studying with prestigious teachers including, Ken Valastro, Brenda Hendrix, Kim English, and Margaretta Gilboy. Her work is currently represented at Breckenridge Gallery, La Galeria Bellas Artes in Mexico and is in private collections in Canada, Great Britain, the U.S. and Mexico. "My brush and paint allow me to create a visual language with my viewer. I concern myself with color, texture and design, sometimes distorting or exaggerating the subject for impact and interest. "Carol Pierce has had both solo and joint exhibits. For solo shows, her personal record was creating 64 works for one show. "I'm a prolific painter and am serious about my work." said Pierce. "My most popular work is my series of ollas. "Although Pierce maintains studios in both Denver and Mexico, she’s a genuine Denver local, having her primary residence there for 35 years. 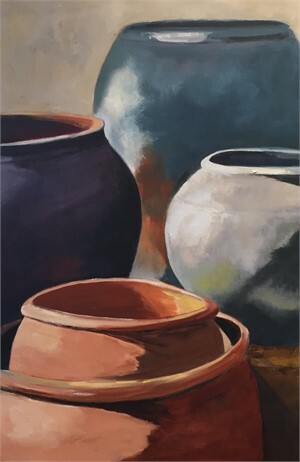 She produces original oil paintings year round, which keeps up with buyer demand and gives her the ability to fill gallery walls.Pierce earned a Bachelor of Arts Degree in Art, and has studied at the Cleveland Institute of Art, Curtis Art & Humanities Center, and the Art Students League of Denver. 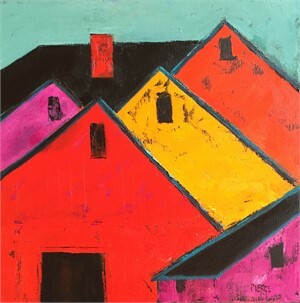 She continuously advances her skill by studying with prestigious teachers including, Ken Valastro, Brenda Hendrix, Kim English, and Margaretta Gilboy.Her work is currently represented at Breckenridge Gallery, La Galeria Bellas Artes in Mexico and is in private collections in Canada, Great Britain, the U.S. and Mexico.